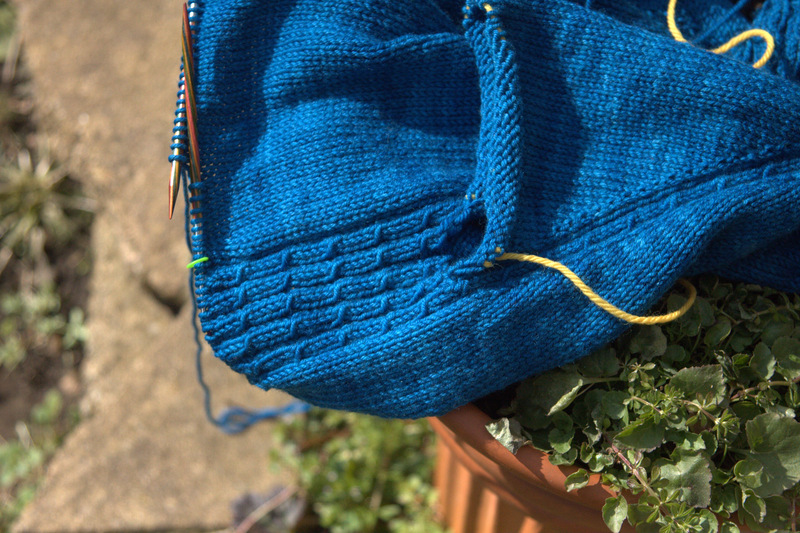 I am happily knitting away on my newest project using Lush Worsted, from The Uncommon Thread. This yarn is a blend, 80% superwash merino, 10% cashmere and 10% nylon. It is also an example of Truth in Advertising. Lush is Lush. I love everything about this yarn. It is so soft and luxurious, and feels so good that I want to knit all day long. Unlike Malabrigo Merino Worsted, that other famously soft wool, it is plied and has resilience and elasticity and bounce. I also imagine that it will not pill like Malabrigo (though that remains to be seen). The colour saturation is also fantastic. This colour is called Pontus, which derives from the Greek word for sea, and it really carries in it all of the shades of a beautiful blue sea. (Pontus also described a part of the coastline of the Black Sea, now in Turkey, where the Amazons resided in Greek mythology.) The colour has movement and texture without too much variegation; it is rich with great depth but doesn’t pool. (Can you tell that I like this yarn?) The stitch definition is also wonderful, and this pattern, which combines a peaceful canvas of stockinette with a twisted stitch detail, shows up this stitch definition perfectly. 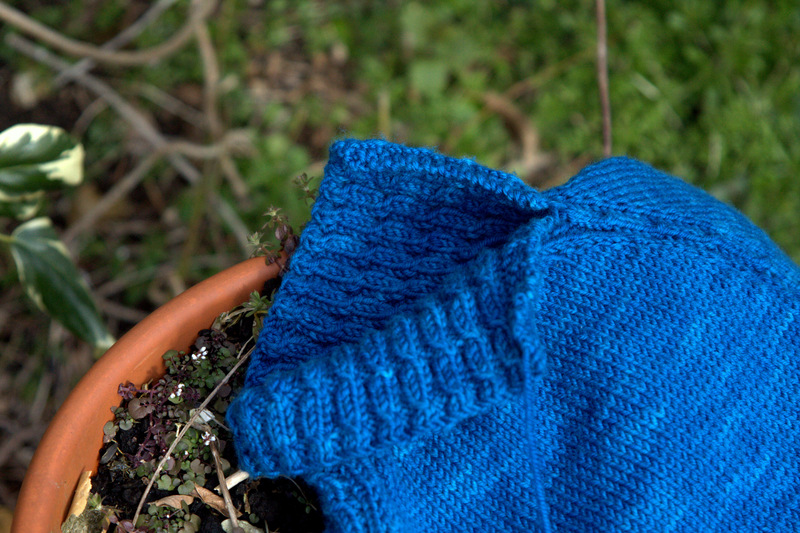 The above photo captures the simple but lovely pattern detail that flows down the sides of this sweater. Also note the collar, in the top photo, where the twisted stitch pattern is reversible and can be buttoned up or left open. As mentioned in my last post, the pattern is the Livvy Pullover, designed by Tori Gurbisz. 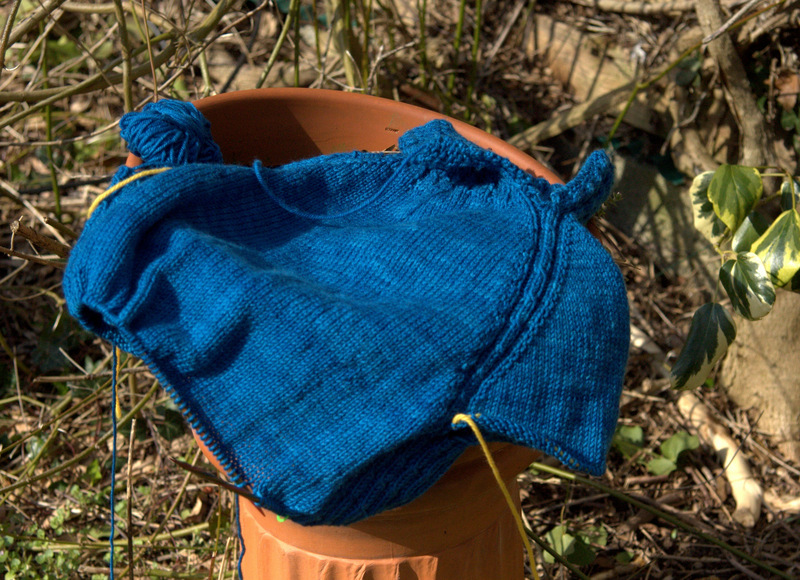 I am planning a number of modifications to the pattern, which I will blog about soon, but so far am knitting as written. To sum up, this yarn is amazing. Lush IS lush. Resistance is futile. Despite the bitter cold this holiday weekend, I am happy. I would like to post more, but Lush is calling to me and my fingers are itching to knit. Happy Easter, Happy Passover, Happy Spring to you all! This entry was posted in Main and tagged Knitting, Livvy pullover, The Uncommon Thread, The Uncommon Thread Lush Worsted, Tori Gurbisz by knitigatingcircumstances. Bookmark the permalink. Hope you’re going to name this project Luscious Livvy, somehow it seems appropriate. You’re a skilled knitter, so I’m curious. What’s your favorite cast on for stitches under the arm? And which one did you test and reject? That’s a great name, Barbara. It’s interesting: when I asked Doug to read this post, he said “You need to write a post about these cast-ons techniques.” So, I’ve put that on my “To write” list. Stay tuned to this spot…. Beautiful! With all your frogging, do you use lifelines? Hi, I only use lifelines when I am knitting lace; otherwise, I just rip. Beautiful sea blue, well named! I met Ce aka “The Uncommon Thread” at a class at Loop last week, she is lovely and really clever! Happy Easter and Happy Knitting to you! Oh, I wish I was there too! I should pay more attention to the class schedule. I was in London this week, but only got as far as the British Library; didn’t make it the extra stop to Loop.